(No. 2.) Sketch of the Public Surveys in Iowa. 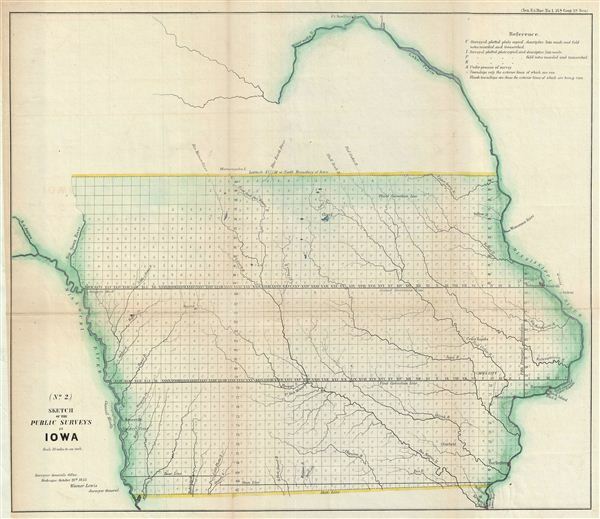 This is an attractive example of the 1855 public survey map of Iowa prepared by Warner Lewis, Surveyor General of Iowa. The map covers the entire state of Iowa. Most of the significant survey work is completed or under process, except the northwest corner, with the state of the land survey noted via a series of blocks representing the survey grid. An explanation in the upper right quadrant explains the various lines on the blocks. The cities of Cedar Rapids, Iowa City, Ft. Desmoines, Dubuque, Davenport, Fairfield, Kanesville, among others are identified. Marks several rivers, lakes and various other topographical details. Prepared for issue in the 1856 congressional report, Maps and Views to Accompany Message and Documents 1855-56.